"You can have anything you want in this world, as long as you know how to steal it." 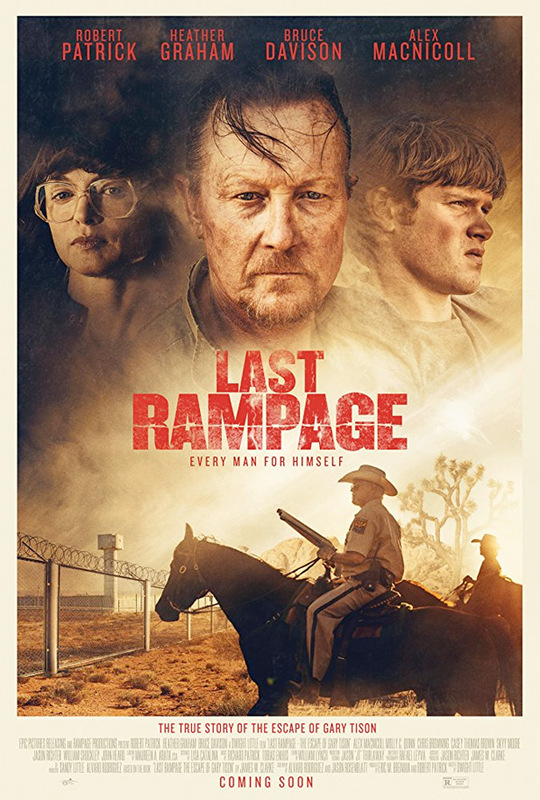 Epic Releasing has debuted a trailer for an action thriller titled Last Rampage, about the true story of a notorious prison break in Arizona in 1978. The film stars Robert Patrick as Gary Tison, a convicted murderer who escaped from prison with his cellmate, played by Chris Browning. While the sheriff, played by Bruce Davison, was hunting him down the two went on a murderous rampage. The film features a "chilling tour-de-force turn by Robert Patrick" in a story "about the dark side of family loyalty." The full cast includes Heather Graham, Molly C. Quinn, Jason James Richter, William Shockley, and the late John Heard. This looks very gritty and violent, perhaps it's an uncomfortable film to watch, but maybe there's something to it. Based on a true story. In the summer of 1978, convicted murderer Gary Tison (Robert Patrick) and his cellmate Randy Greenawalt (Chris Browning) staged a daring escape from an Arizona State Prison, with the help of Tison’s three teenage sons. Their murderous rampage through the southwestern desert shocked the nation with its brutality. While Sheriff Cooper (Bruce Davison) hunted the men down, Tison's wife (Heather Graham) vehemently defended her family in the press. Last Rampage is directed by American filmmaker Dwight H. Little, of the films Getting Even, Bloodstone, Halloween 4, The Phantom of the Opera (1989), Marked for Death, Rapid Fire, Free Willy 2, and Murder at 1600 previously, as well as TV work on "Bones" and "Prison Break". The screenplay is written by James W. Clarke and Álvaro Rodríguez; adapted from the book "Last Rampage: The Escape of Gary Tison" by James W. Clarke. Epic Pictures will release Last Rampage in select theaters + on VOD starting September 22nd this fall. Anyone interested?